Friday March 25th 1904 Will walked to town and was gone all day. I was sewing in the afternoon. Levi helped me wash some in the forenoon. Mollies school was out early as it was the last of the term. Frank came for her. I knit on my lace all evening. Saturday March 26th 1904 It was very cold. I did some ironing and sewing Will and Levi hauled in wood till noon. Levi got word his sister was worse and went to Lone Tree in the afternoon. I was down at Mrs Kosers to do some telephoning. I made lace in the evening. Sunday March 27th 1904 I read in the forenoon when not busy with the regular work. It is very cold. I wrote to May and to Mattie Oustatt in the afternoon. read in the evening and went to bed early. 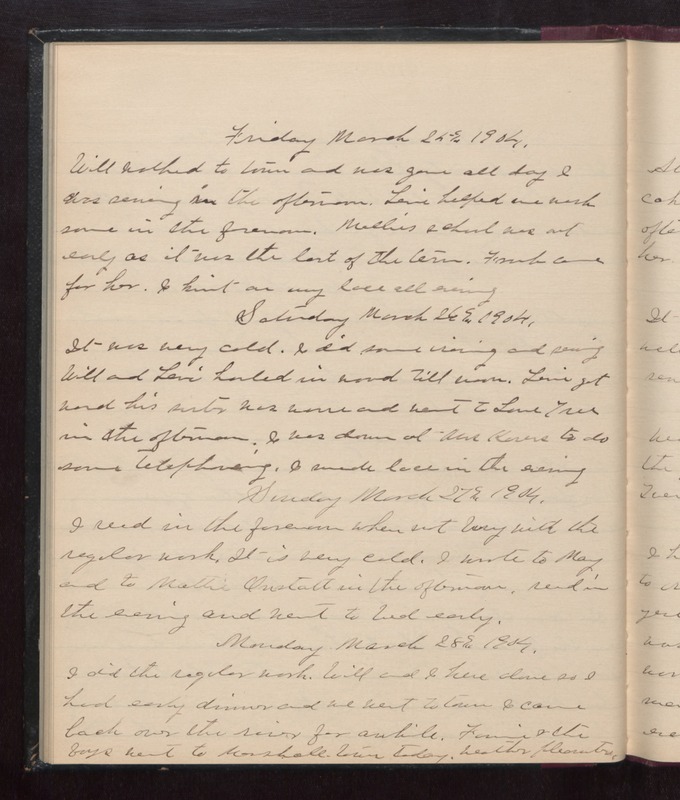 Monday March 28th 1904 I did the regular work. Will and I here alone so I had early dinner and we went to town .I came back over the river for awhile. Fannie & the boys went to Marshalltown today. weather pleasanter.